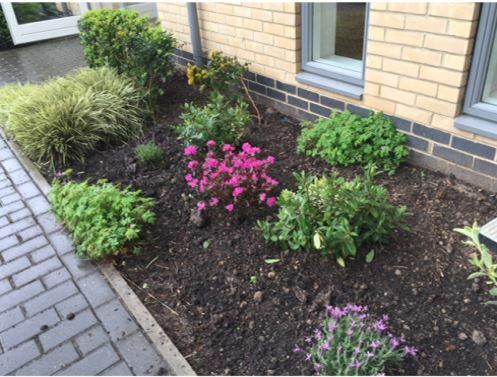 PECT is delighted to be working with Cross Keys Homes to enhance the gardens and communal spaces located at Kingfisher Court, a care home for the elderly. Involving residents and volunteers from the local community, including schools and businesses the project, which started in April 2018, has completed various works in the garden spaces including planting, weeding, watering, making bird feeders, growing new plants from seed and renewing soils. Many of the care homes residents have taken on aftercare responsibilities such as watering, weeding and dead-heading plants and have really enjoyed getting involved in the project and volunteers from various organisations and the local community have got their hands dirty to help out and have also donated items to improve the gardens such as plants, garden furniture, plant pots and cups of tea. Planting days take place every Wednesday from 10am. If you would like to get involved please contact simon.belham@pect.org.uk, or call 01733 568408. “I really enjoyed my time with Simon (project officer) and the residents, it was not only fun but hard work and gave a me a sense of achievement.” Sam, Student, Princes Trust.